B.A. in Sociology/Anthropology, May 1992. This CV is very out of date. Download an updated one here. Associate Professor. Department of Popular Culture; Affiliated Faculty, American Culture Studies, Bowling Green State University. Spring 2009-present. Assistant Professor. Department of Popular Culture, Bowling Green State University. Fall 2003-Spring 2009. Adjunct Instructor. Ramapo College of New Jersey, School of Contemporary Arts. Course Title: “Women, Music and Culture.” Fall 2002, Spring 2003. Upper-level course on world music and gender. multidisciplinary lecture/discussion course on the economic, historical, and cultural aspects of globalization. Instructor. Universitas Atma Jaya (Jakarta, Indonesia), Department of Business Administration. Course Taught: “Introduction to Anthropology,” “Managing Across Cultures.” Spring 2000. All teaching conducted in Indonesian. Instructor. University of Pennsylvania, Department of Anthropology. Course Title: “World Ethnography.” Summer 1999. Writing-intensive seminar on world cultures. Adjunct Instructor. Pennsylvania State University–Delaware County, Department of Integrative Arts. Course Title: “Popular Music in America: 1899-1999.″ Spring 1999. Teaching Assistant. University of Pennsylvania, Department of Anthropology. Course Title: “Introduction to Cultural Anthropology.” Spring 1995. Teaching Assistant. Haverford College, Department of Sociology/Anthropology. Course Title: “Sociology of Crime.” Fall 1992. Guest Lecturer. Bowling Green State University, Columbia University, Drexel University, Germantown Friends School, Haverford College, Northern Illinois University, Oberlin College, Owens Community College, Pennsylvania State University-Delaware County, Pennsylvania State University-Ogontz, Universitas Atma Jaya (Indonesia), University of Denver, University of Pennsylvania, University of Richmond. Topics include: studio technology, anthropology of music, language and culture, the ethnomusicology of rock and roll, Indonesian rock and jazz, jazz history, music and multiculturalism, popular music and aesthetics, popular musics as global phenomena, music and nationalism, anthropology and business, Balinese music, music and religion, music and ritual, hip hop aesthetics and production techniques, western classical borrowings from popular and world musics. 1993-present. Wallach, Jeremy. Modern Noise, Fluid Genres: Popular Music in Indonesia, 1997-2001. New Perspectives in Southeast Asian Studies, Volume 3. Madison. WI: University of Wisconsin Press, 2008. Wallach, Jeremy, Harris M. Berger, and Paul D. Greene, eds. Metal Rules the Globe: Heavy Metal Music around the World. Durham, NC: Duke University Press, 2011. Hickam, Brian and Jeremy Wallach. “Female Authority and Dominion: Discourse and Distinctions of Heavy Metal Scholarship.” Journal for Cultural Research 12(3): 255-277, 2011. Wallach, Jeremy. “Living the Punk Lifestyle in Jakarta.” Ethnomusicology 52(1): 97-115, 2008. Winner of the 2009 Richard Waterman Junior Scholar Prize. _______. “Underground Rock Music and Democratization in Indonesia.” World Literature Today 79 (3-4): 16-20, 2005. _______. “Of Gongs and Cannons: Music and Power in Island Southeast Asia.” Wacana Seni Journal of Arts Discourse 3: 1-28, 2004. _______. “Dangdut Trendy.” Inside Indonesia 78 (April-June): 30, 2004. _______. “The Poetics of Electrosonic Presence: Recorded Music and the Materiality of Sound.” Journal of Popular Music Studies 15(1): 34-64, 2003. ______. “Exploring Class, Nation, and Xenocentrism in Indonesian Cassette Retail Outlets.” Indonesia 74 (October): 79-102, 2002. _______. “Aural Autocracies: Music and Power in Island Southeast Asia.” Middle Atlantic Chapter of the Society for Ethnomusicology Newsletter 15(2): 3-6, 1996. Wallach, Jeremy. 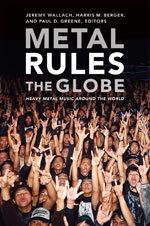 “Unleashed in the East: Metal Music, Masculinity, and ‘Malayness’ in Indonesia, Malaysia and Singapore.” In Metal Rules the Globe: Heavy Metal Music around the World (Jeremy Wallach, Harris M. Berger, and Paul D. Greene, eds.). Durham, NC: Duke University Press, pp. 86-105, 2011. _______. “Engineering Techno-Hybrid Grooves in Two Indonesian Sound Studios.” In Wired for Sound: Engineering and Technologies in Sonic Cultures (Paul D. Greene and Thomas Porcello, eds.). Middletown, CT: Wesleyan University Press, pp. 138-155, 2005. _______. “‘Goodbye My Blind Majesty”: Music, Language, and Politics in the Indonesian Underground.” In Global Pop, Local Language (Harris M. Berger and Michael T. Carroll, eds.). Jackson, MS: University Press of Mississippi, pp. 53-86, 2003. Wallach, Jeremy, Harris M. Berger, and Paul D. Greene. “Affective Overdrive, Scene Dynamics, and Identity in the Global Metal Scene.” In Metal Rules the Globe: Heavy Metal Music around the World (Jeremy Wallach, Harris M. Berger, and Paul D. Greene, eds.). Durham, NC: Duke University Press, pp. 3-33, 2011. Wallach, Jeremy. “Echoes of the Twentieth Century” (Review of Echo & Reverb: Fabricating Space in Popular Music Recording 1900-1960 by Peter Doyle; Middletown, CT: Wesleyan University Press, 2005). Ars Lyrica 18, forthcoming 2010. _______. Review of Making Scenes: Reggae, Punk, and Death Metal in 1990s Bali by Emma Baulch (Durham: Duke University Press, 2007). Journal of Anthropological Research, 65: 331-333, 2009. _______. Review of Black Mirror: Reflections in Global Musics (Dust-to-Digital DTD-10; 2007). Ethnomusicology, 53(1): 176-178, 2009. _______. Review of New York City: Global Beat of the Boroughs (Smithsonian Folkways Recordings SFW CD 40493; 2001). Ethnomusicology 49(3): 209-212, 2005. _______. Review of Songs and Gifts at the Frontier: Person and Exchange in the Agusan Manobo Possession Ritual by José Buenconsejo (Current Research in Ethnomusicology Volume 4, New York: Routledge, 2002), Asian Music 36(1): 123-127, 2005. _______. Review of The Rough Guide to the Music of Indonesia (World Music Network RGNET 1055 CD; 2000), Ethnomusicology 48(3): 464-468, 2004. _______. Review of Prison Songs: Historical Recordings from Parchman Farm 1947-48, Vols.1 and 2 (Rounder Records CD 1714, 1715; 1997). Yearbook for Traditional Music 32: 235-36, 2000. _______. Review of “A History of Siamese Music Reconstructed from Western Documents, 1505-1932″ (T. Miller and J. Chonpairot; Crossroads 8/2:1-192, 1994). Khosana 24: 3-4, 1997. _______. Review of My Music (S. Crafts, D. Cavicchi, C. Keil, and the Music in Daily Life Project; Hanover, NH: University Press of New England, 1993). Oral History Review 23(2): 128-30, 1996. Wallach, Jeremy. “Distortion-Drenched Dystopias: Metal and Modernity in Southeast Asia.” In The Metal Void: First Gatherings, Critical Issues Volume 88 (Niall R. W. Scott, ed.). Oxford, UK: The Inter-Disciplinary Press, pp. 357-366, 2010. Wallach, Jeremy. “Dangdut” and “Global Metal.” In Encyclopedia of Popular Music of the World, Volume IV: Genres (John Shepherd, David Horn, Dave Laing, Paul Oliver, and Peter Wicke, eds.). London: Continuum Press, forthcoming. _______. “World Beat.” In The Garland Encyclopedia of World Music Volume 3: The United States and Canada (Ellen Koskoff, ed.). New York: Garland Publishing, pp. 337-42, 2001. Wallach, Jeremy and Vinay Dharwadker. “South and Southeast Asia.” In The Greenwood Encyclopedia of World Popular Culture, Volume 6: Asia and Pacific Oceania (Vinay Dharwadker and Gary Xu, eds., Gary Hoppenstand, General Editor). Westport, CT: Greenwood Publishing Group, pp. 211-226, 2007. Clinton, Esther, Jeremy Wallach, and Kristen Rudisill, eds. Researching Popular Culture: An Introduction. Forthcoming anthology.under review. Harnish, David and Jeremy Wallach. “Jazz-Rock-Ethnic Fusion Meets the World: Genre and Authenticity in the Music of Indonesia’s Krakatau.” Article in progress. Wallach, Jeremy. “Notes on Dangdut Music, Popular Nationalism and Indonesian Islam.” In Sonic Modernities: Popular Music and New Social Formations in the Malay World (Bart Barendregt and Wim van Zanten, eds. ), edited volume in preparation. _______. “Distortion-Drenched Dystopias: Metal and Modernity in Southeast Asia.” In Music, Metal and Politics (Niall R. W. Scott, ed. ), Probing the Boundaries/At the Interface. Oxford: The Inter-Disciplinary Press, edited volume in preparation. _______. “The Ethnomusicology of Popular Music: A Critical Survey and New Approaches.” Book manuscript in progress. _______, ed. Special Issue of Asian Music on Indonesian musical styles and the politics of genre. Forthcoming Spring 2012. Wallach, Jeremy and Matthew Aslaksen. “Ohio is for Lovers”: Class, Masculinity, and Emotionality in a Midwestern Emo Scene.” Article in progress. Wallach, Jeremy and Alexandra Levine, “Malang, Indonesia and Toledo, USA: A Theory of Metal Scene Formation.” In Heavy Metal: Controversies and Countercultures. (Titus Hjelm, Keith Kahn-Harris, and Mark LeVine, eds., London: Equinox Publishing) edited volume in preparation. “One Finger Metal: Debating Violence in Indonesia’s Heavy Metal Scene.” Panel: “Aesthetics of Fear and Violence in Contemporary Popular Music.” Presented at the American Folklore Society 123rd Annual Meeting, Bloomington, Indiana; October 2011. “‘Like a Real Dinosaur’: Notes on the Quest for Authenticity in Popular Culture.” Department of Popular Culture Colloquium Series, Bowling Green State University, Bowling Green, Ohio; September 2011. “Technohybridity and Genre Formation in Democratic Indonesia.” Invited presentation at “The Impact of Music in Shaping Southeast Asian Societies,” First International Conference of the PhD in Music Program of the University of the Philippines College of Music, Manila, the Philippines; September 2011. “Forging Heavy Metal in the Furnace of the Factory Town: Interrogating the Genre’s Dystopic Origin Myth.” Panel: “Imagining Utopian and Dystopian Landscapes in Current Popular Music” (Organizer). Presented at the International Association for the Study of Popular Music—Canada Annual Conference, Montreal, Canada; June 2011. “‘El Metal No Tiene Fronteras’: The Global Conquest of an Outcast Genre.” Panel: “Metal Rules the Globe: Case Studies in Metal Music around the World” (Organizer and Chair). Presented at the International Association for the Study of Popular Music—United States Annual Conference, Cincinnati, Ohio; March 2011. “Using Indonesian and American Jazz to Understand American Culture.” Presented at the Culture, English Language Teaching and Literature (CELT) Third Annual International Seminar, Soegijapranata Catholic University, Semarang, Indonesia; January 2011. “Wajah Pribumi: Iwan Fals and the Performance of Indonesian Masculinity.” Presented at“The Beat Goes On: Popular Music in Twentieth Century Southeast Asia,” Workshop sponsored by the Royal Netherlands Institute for Southeast Asian and Caribbean Studies (KITLV), Jakarta, Indonesia; January 2011. “‘Easy Listening’: Rethinking Taste Hierarchies in Indonesian Pop.” Panel Title: “Toward an Aesthetic Analysis in Global Popular Musics” (Organizer and Chair). To be presented at the Society for Ethnomusicology 55th Annual Meeting, Los Angeles, California; November 2010. “Rethinking Folk, Popular, and Elite Culture: The Legacy of Ray Browne” (Participant). Panel discussion to take place at the American Folklore Society 122nd Annual Meeting, Nashville, Tennessee; October 2010. “Ghostly Presences: On the Uncanniness of Recordings.” Presented at the Culture and Communication Graduate Colloquium Series, Drexel University, Philadelphia, Pennsylvania, March 2010. “Of Remixes and Robots: Analytical Approaches to Asian Popular Culture.” Department of Popular Culture Colloquium Series, Bowling Green State University, Bowling Green, Ohio; January 2010. “Love Songs and the Global Sound of Pop Romance.” Panel Title: “Sonic Mediation and Studio Technology.” Presented at the Society for Ethnomusicology 54th Annual Meeting, Mexico City, Mexico; November 2009. Co-presenter with Brian Hickam, Thomas Atwood, and Laura Wiebe Taylor. “Rising Force: The Current State of Heavy Metal Scholarship.” Presented at the Midwest Popular Culture Association Annual Meeting, Detroit, Michigan, October 2009. Co-presenter with Brian Hickam. “Female Authority and Dominion: Discourse and Distinctions of Heavy Metal Scholarship.” Presented at the Heavy Metal and Gender Conference, Cologne, Germany; October 2009. “Popular Music Genres in Democratic Indonesia, 1998-2009.” Musicology Colloquium, Oberlin College, Oberlin, Ohio; September 2009. “Popular Music and the Mass Media in Indonesia.” Presented at the Lamont School of Music, University of Denver, Denver, Colorado; March 2009. “Fluid Genres: Indonesian Popular Music, National Identity, and Globalization.” Presented at Colorado College, Colorado Springs, Colorado; March 2009. “Two Indonesian Perspectives on American Popular Culture” (Discussant). Department of Popular Culture Colloquium Series, Bowling Green State University, Bowling Green, Ohio; January 2009. “Global Underground Rock, Mass Mediation, and the Problem of Authenticity.” Panel Title: “Action, Cut, Print! New Cultures of Media Production.” Presented at the American Anthropological 106th Annual Meeting, San Francisco, California; November 2008. “Distortion-Drenched Dystopias: Metal and Modernity in Southeast Asia.” Presented at the “Heavy Fundametalism” Interdisciplinary Conference, Salzburg, Austria; November 2008. “‘Dangdut Is the Best’: Popular Music, Genre Ideology, and the Middle Class.” Panel Title: “Contesting Genre in Indonesia and on the World Stage” (Co-Organizer). Presented at the Society for Ethnomusicology 53rd Annual Meeting, Middletown, Connecticut; October 2008. “A New Subfield? Comics and Music” (Panel Discussion, Organizer and Chair). “The Comic Book in Popular Culture.” Conference sponsored by the BGSU Department of Popular Culture, Bowling Green, Ohio; October 2008. “Genre and Authenticity in the Jazz/World Fusion of Indonesia’s Krakatau.” Presented at the Midwest Chapter of the Society for Ethnomusicology Annual Meeting, Ypsilanti, Michigan; March 2008. “Punk, Metal, Globalization.” Presented at the Popular Culture Association/American Culture Association 30th National Conference, San Francisco, California; March 2008. “Genre, Authenticity, and Hybridity in Indonesian Popular Music.” Department of Popular Culture Colloquium Series, Bowling Green State University, Bowling Green, Ohio; March 2008. “The Relationship between Music and Culture.” Presented at the Honors College, Florida Atlantic University, Jupiter, Florida; February 2008. “‘Dangdut Is the Music of My Country’: Popular Music After Soeharto.” Presented at the Center for Southeast Asian Studies, University of Michigan, Ann Arbor, Michigan; January 2008. “Technology, Commodification, and Authenticity in Popular Music.” Keynote address presented at the Fifth Annual Conference of the South Central Graduate Music Consortium, Duke University, Durham, North Carolina; September 2007. “Iwan Fals, Bruce Springsteen, and the Performance of Indonesian Masculinity.” Panel Title: “Global Rock: New Voices, New Perspectives.” Presented at the Society for Ethnomusicology 50th Annual Meeting, Atlanta, Georgia; November 2005. “Popular Music and Islam in Post-Soeharto Indonesia.” Presented at the Center for Southeast Asian Studies, Northern Illinois University, DeKalb, Illinois; April 2005. “Vampires and Mosh Pits in the Global Village: Producing an Indonesian Rock Music Video.” Presented in the Haverford College Young Alumni Lecture Series, Haverford, Pennsylvania; February 2005. “Playful Identifications and Hybridic Performativity at Urban Indonesian Acara.” Presented at the Society for East Asian Anthropology Mini-Conference, Berkeley, California; November 2004. “Dangdut Underground: ‘Low Class’” Music and National Belonging in Indonesian Student Culture.” Presented at the School of Music Colloquium Series, University of Wisconsin-Madison, Madison, Wisconsin; March 2004. “Dangdut Music, Indonesian Islam, and ‘Unofficial Nationalism.’” Presented at the Royal Netherlands Institute of South-East Asian and Caribbean Studies 17th Annual International Workshop on South-East Asian Studies. Workshop Title: “South-East Asian Pop Music in a Comparative Perspective.” Leiden University, The Netherlands; December 2003. “From Theme Park to Mall: Representing Tradition and Modernity in an Indonesian Music Video.” Department of Popular Culture Colloquium Series, Bowling Green State University, Bowling Green, Ohio; October 2003. “Relieving Stress, Resisting Desire: Gendered Exchange at Jakartan Dangdut Performances.” Panel Title: “Music, Desire and Attraction” (Chair). Presented at the Society for Ethnomusicology 48th Annual Meeting, Miami, Florida; October 2003. “Popular Culture and Grassroots Nationalism: The Case of Dangdut Music in Indonesia.” Presented at the Department of Popular Culture, Bowling Green State University, Bowling Green, Ohio; April 2003. “Metacultural Performance: Music, Nation, and Mediation in Jakarta, Indonesia.” Presented for the Anthropology Program, Massachusetts Institute of Technology, Cambridge, Massachusetts; February 2003. “From Studio to Street Corner: Production, Reception, and Replication of Dangdut Music in Indonesia.” Presented at the Department of Music, University of Richmond, Richmond, Virginia; January 2003. “Rock and Reformasi: Indonesian Student Culture and the Demise of the New Order. ”Panel Title: “Can the Subaltern Sing? Asian Youth, Popular Music, and Social Movements” (Co-Organizer). Presented at the American Anthropological Association 100th Annual Meeting, New Orleans, Louisiana; November 2002. “Hebdige Was Wrong! : Living the Punk Lifestyle in Jakarta.” Panel Title: “Punk in the 21st Century” (Co-Organizer and Chair). Presented at the Society for Ethnomusicology 47th Annual Meeting, Estes Park, Colorado; October 2002. “‘Because My Soul is Malay’: Genre, Class and National Authenticity in the Indonesian Student Music Scene.” Presented for the Department of Music, Ethnomusicology Colloquium Series, Columbia University, New York City; February 2002. “Ska Dangdut? : The Cultural Politics of the Indonesian Ska Craze.” Presented at the Society for Ethnomusicology 46th Annual Meeting, Southfield, Michigan; October 2001. “The Modern Noise Makes Modern People, Part Two: Dangdut Goes Underground.” Department of Anthropology Graduate Student Colloquium Series, University of Pennsylvania, Philadelphia, Pennsylvania; March 2001. “Rocking in the Free World: Global Perspectives on Heavy Metal” (Panel Discussion). Organizer and Chair. Society for Ethnomusicology 45th Annual Meeting, Toronto, Canada; November 2000. “Engineering Techno-Hybrid Grooves in an Indonesian Sound Studio.” Presented (in absentia) at the Society for Ethnomusicology 44th Annual Meeting, Austin, Texas; November 1999. “Natural and Unnatural Sounds: Indonesian Pop as Musical Cyborg.” Presented at the American Ethnological Society 121st Annual Meeting, Portland, Oregon; March 1999. Student Commentator. Ethnohistory Workshop, University of Pennsylvania, Philadelphia, Pennsylvania; January 1999. “Muzik Popular Malaysia dan Masyarakat Modern [Malaysian Popular Music and Modern Society].” Presented at Universiti Kebangsaan Malaysia, Bangi, Selangor, Malaysia; August 1998. “Underground Rock at Jakarta’s Poster Café.” Presented at the Middle Atlantic Chapter of the Society for Ethnomusicology Annual Meeting, College of William and Mary, Williamsburg, Virginia; April 1998. “Beyond Performance: Music Recordings and the Materiality of Sound.”Presented at the Society for Ethnomusicology 42nd Annual Meeting, Pittsburgh, Pennsylvania; October 1997. “Identity and Its Discontents: Popular Music, Modernity, and Changing Conceptions of the Self.” Department of Anthropology Graduate Student Colloquium Series, University of Pennsylvania, Philadelphia, Pennsylvania; September 1996. “Aural Autocracies: Music and Power in Island Southeast Asia.” Presented at the Middle Atlantic Chapter of the Society for Ethnomusicology Annual Meeting, Peabody Conservatory, Baltimore, Maryland; March 1996. “Love and Pronouns: Discourse Analysis of an Indonesian Pop Song.” Presented at the East Asian Studies Graduate Student Conference, Columbia University, New York, New York; February 1996. Pennsylvania, Philadelphia, Pennsylvania; October 1995. Invited Participant, “The Beat Goes On: Popular Music in Twentieth Century Southeast Asia.” Workshop sponsored by the Royal Netherlands Institute for Southeast Asian and Caribbean Studies (KITLV) to be held January 10-11, 2011 in Jakarta, Indonesia. Thesis Advisor, “‘You Must Defeat Shen Long To Stand A Chance’: Street Fighter, Race, Play, and Player” by Nicholas Coleman Ware (M.A., Popular Culture, 2010), nominated for the BGSU Graduate College 2010 Distinguished Thesis Award. Faculty Improvement Leave, Bowling Green State University, 2010-2011 Academic Year. Richard Waterman Junior Scholar Prize, Popular Music Section of the Society for Ethnomusicology, for “Living the Punk Lifestyle in Jakarta.” (Ethnomusicology 52: 97-115, 2008), 2009. Thesis Advisor, “‘In Our Different Ways We Are the Same’: Representations of Disability in the Music and Persona of Morrissey” by Daniel Jeremy Manco (M.A., Popular Culture, 2009), nominated for the BGSU Graduate College 2009 Distinguished Thesis Award. Klaus Wachsmann Prize, Society for Ethnomusicology. Awarded to Wired for Sound (Greene and Porcello, eds., Middletown, CT: Wesleyan University Press, 2005), 2006. Gustave Reese Publication Fund of the American Musicological Society. 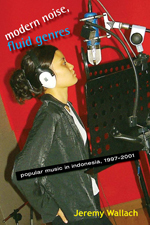 Publication subvention awarded for Modern Noise, Fluid Genres: Popular Music in Indonesia, 1997-2001, 2006. Bowling Green State University Scholars Assistance Program. Publication subvention awarded for Modern Noise, Fluid Genres, 2005. Center for Southeast Asian Studies, University of Wisconsin-Madison. Publication subvention for Modern Noise, Fluid Genres, 2005. Thesis Advisor, “‘We Feed off Each Other’: Embodiment, Phenomenology and Listener Receptivity of Nirvana’s In Utero” by Christopher Martin (M.A., Popular Culture, 2006), nominated for the BGSU Graduate College 2006 Distinguished Thesis Award. Thesis Advisor, “My Boy Elvis: Gender, Fandom, and Performance in Rock and Roll” by Angela Fitzpatrick (M.A., American Culture Studies, 2005), Winner of the BGSU Graduate College 2005 Distinguished Thesis Award. Invited to attend the BGSU 37th and 38th Annual Honors and Awards Reception as a “Favorite Faculty Member.” Spring 2005, Spring 2006. Invited Participant, The Royal Netherlands Institute of South-East Asian and Caribbean Studies 17th Annual International Workshop on South-East Asian Studies. Workshop Title: “South-East Asian Pop Music in a Comparative Perspective.” Leiden, The Netherlands. December 2003. United States-Indonesia Society Travel Grant. Supported travel costs for overseas dissertation research. 2000. Teaching Assistantships, Department of Anthropology, University of Pennsylvania. 2000, 1996, 1995. United States Department of Education, Fulbright Hays Group Projects Abroad Program. Fellowship and tuition waiver for language study at the Consortium for the Teaching of Indonesian and Malaysian, University Kebangsaan Malaysia. 1998. Departmental Field Funds. Department of Anthropology, University of Pennsylvania. Supported a pre-dissertation pilot study in Indonesia. 1997. Writing Fellow, Writing Across the University, University of Pennsylvania. 1993-1997. Foreign Language Area Studies Fellowship (Title VI) for language study at the Southeast Asian Studies Summer Institute, University of Wisconsin-Madison and Arizona State University. 1995, 1996. Hewlett Pantaleoni Student Paper Prize, Middle Atlantic Chapter of the Society for Ethnomusicology. 1995. Honorable Mention, Usha Mahajani Prize, Southeast Asian Studies Summer Institute, University of Wisconsin-Madison. 1995. Magill-Rhoads Scholar, Haverford College. 1989-1991. Chair, Popular Music Section of the Society for Ethnomusicology. 2010-2012. President, Midwest Chapter of the Society for Ethnomusicology (MIDSEM), 2010-2011. Society for Ethnomusicology Councilperson, 2009-2012. Publicity Coordinator/Newsletter Editor, Department of Popular Culture, Bowling Green State University, 2009-2011. Co-Organizer, Asian Popular Culture Symposium, Bowling Green State University, 2010. Program Committee, Midwestern Chapter of the Society for Ethnomusicology Annual Meeting, 2010. Asian Studies Program Advisory Committee, Bowling Green State University. 2005-2010. American Culture Studies Advisory Committee, Bowling Green State University. 2006-2010. Chair, Keynote Speaker Committee. Popular Music Section of the Society for Ethnomusicology. 2008-2011. Co-Organizer, Residency at Bowling Green State University for Dr. Sarah Morelli (Indian Kathak dancer and ethnomusicologist), Spring 2009. Inter-Disciplinary.Net Steering Group for the Music, Metal and Politics project, 2008-2011. Ethnic Cultural Arts Program (ECAP) Executive Committee, Bowling Green State University, 2003-2010. Graduate Admissions Committee, Department of Popular Culture, Bowling Green State University. 2004, 2009. Jaap Kunst Prize Committee, Society for Ethnomusicology. Prize awarded to the most outstanding article in ethnomusicology published during the previous calendar year, 2008. American Culture Studies Ph.D. Executive Committee. Bowling Green State University, 2008-2009. Faculty Advisor, Bowling Green State University Hillel, 2005-2007. Consultant, Global Metal (documentary film), Banger Productions, 2006-2008. Keynote Speaker Committee. Popular Music Section of the Society for Ethnomusicology. 2003-2008. Program Committee, MIDSEM Annual Meeting, Spring 2005. Proposal Screener, International Dissertation Field Research Fellowship Program, sponsored by the Social Science Research Council and American Council of Learned Societies. 2004, 2005. Tenure-Track Faculty Recruitment Committee, Department of Popular Culture, 2004-2005. Instructor Recruitment Committee, Department of Popular Culture, Summer 2004. Co-Organizer, Concert at Bowling Green State University featuring Krakatau (Indonesian ethnic jazz fusion group), Summer 2004. Lise Waxer Memorial Prize Committee. Awarded by the Popular Music Section of the Society for Ethnomusicology for best student paper on popular music presented at the national SEM conference. 2003. Senior Copywriter. IndonesianArt.net (Jakarta, Indonesia). Contributed, translated, and edited copy for a multimedia Web sitefocusing on the art, music, literature, and mass media of Indonesia. 2000. Research Assistant. Dr. Guthrie Ramsey, University of Pennsylvania, Department of Music. 1998. Research Assistant. Dr. Webb Keane, University of Pennsylvania, Department of Anthropology. 1995- 1996. Co-Founder and Publicity Manager. University of Pennsylvania Department of Anthropology Graduate Student Colloquium Series, 1995-96, 1998-99. The Swedish Musicological Society’s Internet Publication STM-Online, 2010. Book Series of the European Association of Social Anthropologists, 2010. Asia Pacific Journal of Anthropology, 2009.
International Association for the Study of Popular Music – New Zealand (IASPM-NZ) Conference Proceedings, 2008. Kasarinlan: Philippine Journal of Third World Studies, 2007. Journal of Popular Music Studies, 2006. Internet Journal of Ethnomusicology, 2002. Indonesian, Malay (Malaysian), Jakartanese Malay.